John Bradley’s mean-spirited, unethical behavior as chair of the Texas Forensic Science Commission appears to have lost him support in the Texas Senate for his confirmation. 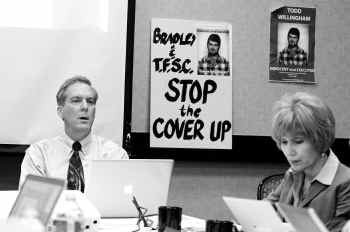 We pushed for John Bradley’s removal as chair of the Texas Forensic Science Commission from the day he was appointed in 2009 because we knew his appointment was part of an attempt to impede the investigation into whether faulty forensic science led to the wrongful conviction of Todd Willingham. Now, it appears that the Texas Senate agrees with us that John Bradley is unfit to be chair of the Forensic Science Commission. The confirmation of Williamson County District Attorney John Bradley as chairman of the state Forensic Science Commission appears to be in deep trouble, as two Senate Republicans confirmed today that they will vote no. That would leave Bradley four votes short of the required 21 needed to bring his name up for a Senate vote. It also means that Bradley will almost certainly remain as chairman of the nine-member commission for a scheduled April 15 meeting, where it could possibly take action on the controversial Cameron Todd Willingham arson case. Willingham was executed in February 2004 on charges that he murdered his three children by torching their Corsicana home in 1991. He denied killing his children, and an expert hired by the commission said in an August 2009 report that the original arson finding was not sustainable. Gov. Rick Perry, during a re-election campaign, abruptly replaced three members of the commission and named Bradley, known for his adamant style, as the new chairman. That nomination is now subject to Senate confirmation. But unlike the 2009 nominations of Burleson County businesswoman Shanda Perkins for the state Board of Pardons and Paroles, and Don McLeroy as chairman of the State Board of Education, Deuell said there is no plan to call Bradley’s nomination to a vote so he can be officially voted down. Bradley said there is no deadline for a vote and that he is continuing to talk to senators to line up support. “The senators have a right to express their opinions,” he said, declining to detail the ongoing talks. Should the Senate not vote further on Bradley’s nomination, his term would end at the end of the legislative session in early June. Should the logjam break and his appointment be confirmed, Bradley’s term would end in September. “I’m getting quite the education in criminal justice, politics and forensic science,” he said. Last week, Bradley and Sen. Rodney Ellis, D-Houston, tangled during a testy verbal exchange during the Nominations Committee hearing. Bradley accused Ellis of having a conflict of interest by serving as chair of the New York-based Innocence Project, which is pushing to overturn the arson finding in the Willingham case. At one point, Deuell interceded to demand more civility between the two. Bradley was unapologetic for the exchange, and Ellis within hours had lined up the support of the Senate’s 12 Democrats to block the nomination. Two Republicans soon joined then. Sen. Kevin Eltife, R-Tyler, said he is against Bradley’s nomination because of his controversial tenure as chairman of the commission. The exchange with Ellis is “only the latest example,” he said. Sen. John Carona, R-Dallas, said he also opposes Bradley’s nomination, and has no intention of changing his mind. Bradley’s Republican supporters said they hoped to persuade Sen. Eddie Lucio, D-Brownsville, to vote for the nomination. But Lucio said he is not switching.